Cline Rents offers a number of excavators with different buckets and attachments to meet your needs for excavating in Lynnwood. An excavator is a piece of earth moving equipment. Sometimes referred to as a digger, an excavator is made up of a reinforced cab where the operator sits, a boom that extends out from the cab, a dipper attached to the boom, and a bucket on the end of the dipper. The entire assembly is usually mounted on a tracked or wheeled base that is capable of rotating up to 360 degrees. Excavators were originally built with pulleys and cables with steam power to drive them. As technology has improved, excavators are gas or diesel powered and use hydraulic cylinders and pumps to move the articulated arm. There is a wide variety of excavators available on the market in many different sizes and capacities. Most excavators have detachable buckets allowing them to be outfitted with much more than a bucket, essentially make them much more than an excavator / earth mover. We try to stock the most useful mix for a variety of jobs needed by people wanting to do an excavator rental. Kenmore commercial operations and individuals alike will find we can often meet their needs. Excavators come in a variety of sizes and operating weights. The industry has settled on common nomenclature for the different size ranges. 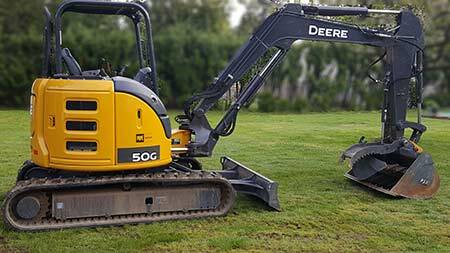 Cline rents carries a range of Lynnwood excavator rentals in all but the largest class. 0 - 6 Metric Tons, "Micro, Compliant"
6 - 25 Metric Tons, "Mini, Construction Class"
25 - 40 Metric Tons, "Mini, Construction Class"
Weight refers to the overall weight of the machine. In general it has little bearing on use except in certain situations. Of course it is very important in terms of transport and truck carrying capacity. But beyond that weight can be very important in situations where soil compaction is not wanted, where you might be moving across a septic field, sprinkler lines, septic tank or other underground improvements, or the ground is soft or unstable such as a concrete patio or driveway. In these situations it may be better to use a smaller machine and take a little extra time in order to preserve other assets on the property. Operating weight also referred to as lift capacity refers to the maximum weight that can be lifted by the bucket at a specific distance. This is the safe weight so that the excavator does not tip over in a lifting or extension operation. How much operating weight you will need depends upon the make up of hte material you are lifting, how much you must lift at a time (is a solid piece or is it an aggregate) and the distance from the cab the boom must be extended in order to clear the lift. Physical size of the excavator is of critical importance as you can imagine. Egress and Ingress at the site must be considered. Operating room once on the site including swing radius, overhead obstructions, cab clearance, etc should be measured before deciding on a Lynnwood excavator rental. Dump height is usually most important when you are planning to place the excavated material directly into a dump truck. Make sure the dump height including bucket clears the side of the truck. Digging depth specifies how deep the excavator can reach down at a specific distance from the cab. Digging depth is important for trenching operations in particular. If you are planning to dig utility trenches, foundations or basements this may be critical. In cases where earth stability is an issue and the machine requires distance from the abyss, depth plus distance is key. Many times in combination with excavation equipment we see people with the need for a dump trailer. It is great for loading and hauling debris and vegetation for smaller jobs. We do a good amount of dump trailer rentals in Kenmore as you might expect. Check them out here.